Modern kitchen appliances helps Housewives to save time, wash fewer dishes, and thus to prepare not less tasty and even more healthy meals. Cook the chicken in the microwave in the package, it is very convenient, incomparable, quickly and extremely nutritious. - 1/4 tsp of oregano, turmeric, Basil, thyme, and white pepper. Wash the chicken under running water, remove excess skin, fat and sear over the fire from the remnants of feathers, if any. Pat the bird with paper towel or allow to dry naturally. RUB it with salt and spice mixture both outside and inside and leave for half an hour to absorb their flavor and aroma. Remove the husk from garlic cloves, gently press on them with the wide side of the knife blade and place inside the bird. 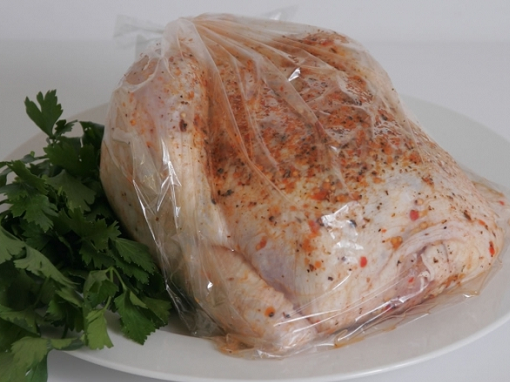 Place the chicken in the oven bag back up, lift up the free edge and secure it, either tying in a knot or fixing the attached clip or just a solid string. Pierce bundle 5-7 times with a toothpick or fork, lest he burst from the overflow of steam during cooking, and you don't have to wash technique. Place it on a ovenproof dish and place in microwave oven. Set the capacity equal to 800 W, and bake the bird in the microwave for 25 minutes. Tear film for 5-7 minutes before end of cooking, if you want to get a ruddy crust. - 3 sprigs of parsley and dill. 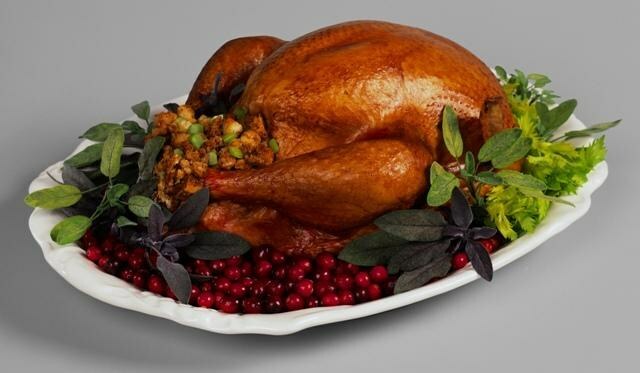 Prepare the bird as mentioned in the first recipe, and cut it into pieces – drumsticks, thighs, wings and breast quarters. Put everything in a deep container. Pour the sour cream and water in a clean bowl, add the mentioned spices and salt. Finely chop the olives, get rid of the dry top layer of the onion, thinly slice and crush with your hands or a potato masher. Add the vegetables to the marinade, cover them the main ingredient and mix thoroughly. Soak the chicken so at least one hour, and ideally a few in the fridge under foil or a lid, then place in the oven bag, convenient tamp and pour the sauce remaining in the dish after marinating. Put all in the microwave for a special heat-resistant utensils made of glass with a flat bottom. Cook the dish for 20 minutes at 800 watts. Put it on one or shared the plate along with sauce and sprinkle with chopped parsley and dill. Chicken grill is one of the most popular dishes around the world. When cooking it at home it is much healthier and tastier. This recipe is very simple to prepare. This dish can any hostess, not only to decorate the family dinner, but a festive table. Perfectly crispy chicken and grill it the microwave. Bought the chicken need to gut, of course, only if it is not gutted. Next, wash and dry, for this purpose it is necessary to put on a paper towel. Prepare a mixture of seasonings, you can unleash all your imagination or just buy a ready-made store-bought seasoning. Indian spices is the best approach to the chicken grill. If there are none you have, then try the "Aromatics". Ready the seasoning, sometimes you need to add a bit of salt and pepper. With the mixture RUB the chicken, inside and out. Peel two heads of garlic, one skip through chesnokodavku and liberally brush over the carcass, and the other head cut into slices and paste them into specially made holes in the chicken. Moreover, the deeper, the better. Next, you need to leave prepared the meat for 30 minutes for marinating. And if you don't want to prevent the breakage of the microwave, it is best to wrap the ends of the legs and wings in foil. Foil should not fly, because otherwise you get a discharge, which invalidates the magnetron. To microwave oven panel, select the mode "Grill" and place the chicken on the grill. Fry on both sides for 15 minutes. Under the grill it is best to substitute any dish in order to her dripping juice from chicken. If you do not have the mode "Grill" in the microwave, then you can do oven. In this case, cooking time chicken grill will increase. At a temperature of 200 degrees fry the chicken first for 20 minutes and rest 20 minutes at 220 degrees. Don't forget to flip the chicken! And fry need until Golden color.Optionally, you can decorate the finished dish with fresh tomatoes and zucchini cooked in a double boiler. And if we sprinkle them with soy sauce, then the chicken grill gains a certain piquancy. Nutritionists include chicken easily digestible kind of meat. On its preparation in a microwave oven will not need much time. Besides welded so the chicken is delicious and low-calorie. – salt and spices to taste. 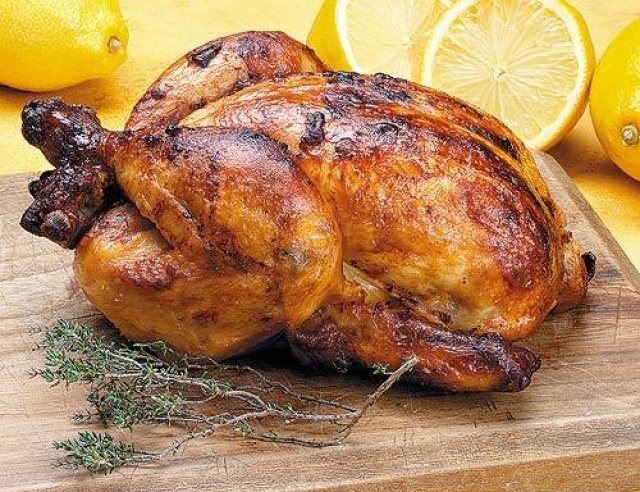 Choose chicken small size, 1 – 1.5 kg, so it's roasted evenly. Frozen carcass be sure to fully defrost before cooking. Remove all the innards and rinse it under cold running water. If you want to cook low-calorie diet dish, then remove from the carcass the skin. Tie wings and legs to the body, kill them with wooden toothpicks, if you want to cook the chicken entirely. She needs to take a compact oval shape. Or cut the bird into serving pieces. Then add salt and sprinkle the meat with seasonings according to your taste. Place the prepared meat in a deep bowl for the microwave. Whole carcass lay breast down. Pour the meat with boiling water to completely cover the chicken, but the bowl was a place for boiling. Top cover dome lid for microwave ovens with a hole for steam. Place the bowl with the chicken in the microwave on high and wait until the liquid boils. On average, at a power of 1000 watts it would take about 4 minutes. Cook a young bird at maximum capacity. If the meat from the chicken hard, then choose the mode average power that the chicken was heated and was prepared longer for the softening of meat. After 10 minutes remove the lid-the cap, flip the chicken and again place in microwave for 10-15 minutes on the same mode. Check when the chicken is done, pierced her in several places with a wooden toothpick. The juice should be transparent, but not pink. Ready chicken remove from broth, cover with foil which keeps the heat and leave for 10 minutes to cool below the cooking process is finalized. If you pull it out of the broth still hot, it will lose moisture and the meat will be dry. Grilled chicken can be served as a main dish and as a hot appetizer. It is possible to prepare at home, if you've got a microwave. The dish will be as tasty as purchased in a special store or restaurant. Take a whole chicken and prepare it for use. If it has feathers, it should be pluck and singe. A whole chicken should get rid of the entrails by making incision from the belly of the bird. Make a marinade. For this mix vegetable oil and lemon juice, add finely chopped garlic, salt and spices to taste - cumin, coriander, rosemary. Cover the chicken with this mixture inside and outside and leave for about an hour. Prepare a microwave. Select the appropriate mode for cooking. This can be a combination of microwaves and grill, or just grill. Depending on this, pick up the utensils for cooking. If you are not using microwave, you can cook the chicken on the spit or on the metal grate, which was sold in kit your oven. When you turn on the microwave mode should be used demetallizing the dishes, and heat-resistant, for example, special glass dishes for the microwave oven. Put the chicken in the oven after setting the desired cooking time depending on weight of chicken. If roast is not on the spit, priblizitelno in the middle of cooking, stop the program and turn over the chicken carcass for uniform baking. 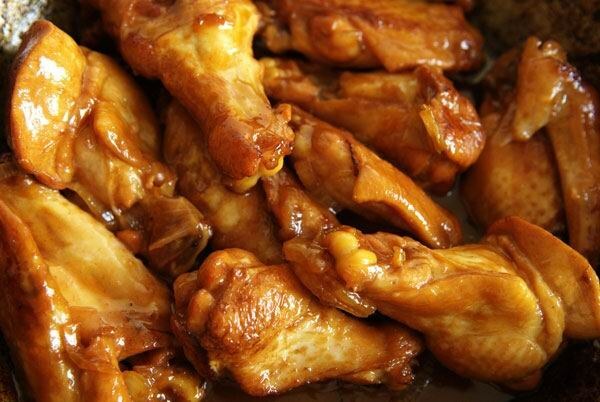 If you are not using microwave, should wrap it in foil the tips of the chicken legs and wings to prevent them from drying. To achieve a more Golden brown crust, cook the chicken for several minutes, then remove from oven and brush with a mixture of mustard and honey. This, moreover, will give the dish additional flavor nuances. When the chicken is done check with a fork after the winter. If at the piercing of the skin clear juice - the meat is ready. Serve the chicken with the garnish, which you can use mashed potatoes, boiled rice or fresh vegetables. The chicken can be boiled, fried, baked in the oven and even cook in the microwave. The latter method gives the possibility of saving on time to obtain tasty and healthy dish. In a microwave oven, you can cook whole carcass, fillets, or chicken, complemented with the appropriate garnish. - 1 Cup of buckwheat. This dish diversifies the diet diet. It contains almost no fat, and properly cooked bird turns out very juicy. Chicken fillet wash, dry, cut in half lengthwise. Remove the grease and film. In a bowl pour the curry powder. The chicken add salt, roll in curry and lay on a plate for the microwave oven. To fillet, make a few punctures with a fork. Cover the dish with a lid and bake the chicken 8 minutes on full power. Serve with steamed cauliflower or pasta with cream sauce. In a microwave oven can be cooked more complex dishes. Tomatoes pour over boiling water, remove the skin, chop flesh. Garlic skip through the press. Put tomatoes and garlic in a bowl, add dried oregano, rosemary, Basil, thyme. Mix everything and cook in the microwave at maximum power for 1-2 minutes. Stir and cook for another 2 minutes. Cheese grate, mix with breadcrumbs and dried parsley. Lightly beat the egg. Chicken fillet wash, dry, slightly repel. If the pieces are too big cut them in half. Dip fillets in egg and then obvalivat bread mixture. Place the prepared chicken on a plate and put in the microwave, turned on at full power. Bake the fillets for 5 minutes, then flip and cook for another 5 minutes. Pour the chicken tomato sauce and bake for another 3-5 minutes. Serve garnished with parsley. As a suitable side dish French fries or vegetable puree. This simple and nourishing dish can be prepared in just half an hour. First, enjoy a porridge. Rinse the barley, put it in a plastic or glass bowl for the microwave. Pour in water so that it covers the rump for 2 cm Add salt and put the saucepan in the microwave. Cook porridge for 12 minutes at maximum power. Remove the pan from the oven and cover with a lid. Chicken legs, rinse, remove excess fat and skin. RUB the chicken with salt and pepper, place on the grill for the microwave, put it under a bowl for collecting grease. To the bird form a Golden crust, cook it in combined mode "grill plus microwave". Bake chicken for 8 minutes, then flip them and fry for the same amount. Check availability, stabbing the meat with a fork. The juice flowing from chicken should be clear. In buckwheat pour a couple of tablespoons of fat, bacon chicken, mix well. Put on a plate of ham, add a serving of buckwheat and serve, sprinkled with herbs.